Barbados Diving: Scuba Operators, Dive Sites, FREE Holiday! Scuba Diving In The Caribbean! The fringes and reefs found off Barbados blossom with healthy sponges, coral and plant life. 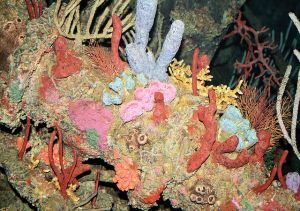 There are several types of reefs, each one unique in its own special way. The barrier reefs, located 1/2 - 2 miles from shore contain large coral heads which form the habitat for thousands of beautiful fish and are perfect for snorkeling. Larger organisms are also found on these reefs, feeding on the smaller fish. The Hawksbill turtle can also be found on these reefs. Fringes and patching reefs are found closer to shore and have smaller coral formations and more abundant plant life then the barrier reefs. These reefs are home to Sea Horses, Frog Fish, Giant Sand Eels and many other marine creatures. Wrecks form fascinating habitats for marine life and Barbados has several excellent sites for wreck diving. Carlisle Bay, with 200 reported wrecks, and the Stavronikita, located at Folkestone Marine Park, are two of the most popular sites. Barbados is ideal for year-round diving but is probably best in the summer months. The visibility ranges from 40 to 70ft and the water temperature is a consistent 80°F. There are several dive operators who will provide equipment, advice and guided tours to ensure that your diving experience is extremely enjoyable! Explore sunken treasures underwater while diving in Barbados' crystal clear waters! Barbados Blue offers a variety of courses and dive packages, with special scuba diving instruction for kids! Ideally located a stone’s throw from the Carlisle Bay Marine Park, The Dive Shop Ltd. offers great diving adventures for any level - from first time divers to seasoned professionals. With its proximity to great beaches and fantastic scuba diving packages, The Palms Resort is the perfect place to stay if you are looking to enjoy some scuba diving adventures while on holiday! Enjoy snorkelling at Coconut Court Beach Hotel's beautiful reef. Ideally located near to some of the island’s best dive sites. Good value with an unbeatable beachfront location!